Of course I had to include a list for the girls as well! 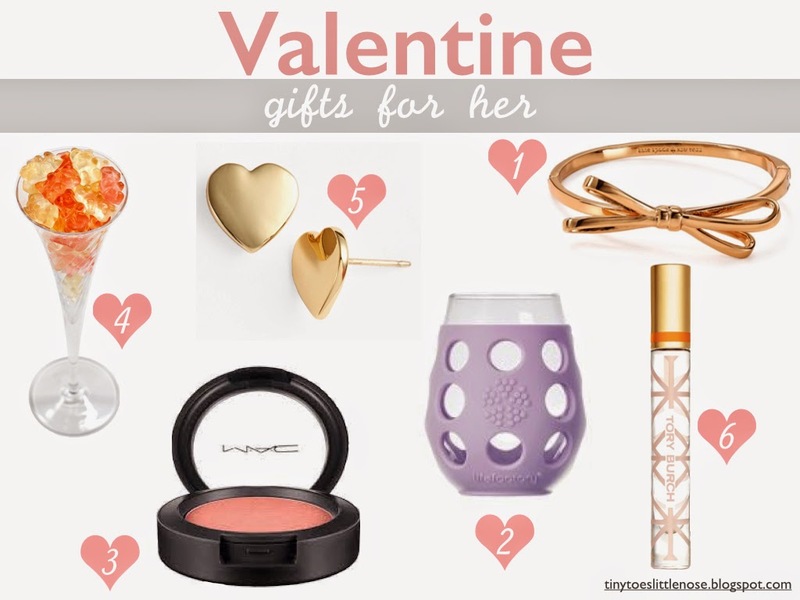 Valentine's Day can be the perfect opportunity to splurge on yourself, or surprise a good friend or your mom with a little something! I received the bow bracelet as a gift, & it has quickly become one of my favorite pieces of jewelry! And I would gladly accept those stud earrings & a rollerball perfume to throw in my new fancy diaper bag! Who else is eyeing a few things for themselves...?! Definitely eyeing those gold heart studs!!! These are great! I love the earrings and the bracelet, so fabulous! Bubbly gummi bears?! Yes please! I am all for anything that involves gummy bears! Love the bow bracelet! The bow bracelet is stunning in person! So beautiful & feminine! Oh yes, the bubbly gummi bears and that bracelet..!! Can you email blast this to all husbands?! :) Fun finds.